World class vending machines, Now in India! Star is a feature packed vending machine. It is a truly versatile snack and beverage solution with very high capacity , ideal for larger sites which have high footfalls. Serves Snacks, Beverages and certain Food items. 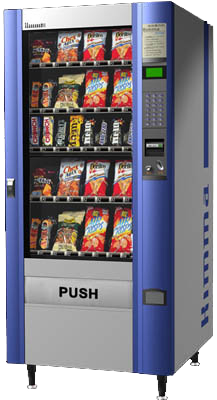 Bite is an ultra reliable, high capacity and highly flexible snack machine. It is easily configurable to accommodate your requirements. An ideal as a “Stand Alone” machine. A perfect energizer in a single stop. Serves Snacks and certain Food items. Fresshy by Instago represents a completely new approach to machine design and has been exclusively styled. It takes food vending to a new level. Fresshy comes in a range of offerings and can offer fresh food items like fruits, sandwiches, milk and many more. We have top class products that keep your workforce going all the time. Get in touch with us to get started.